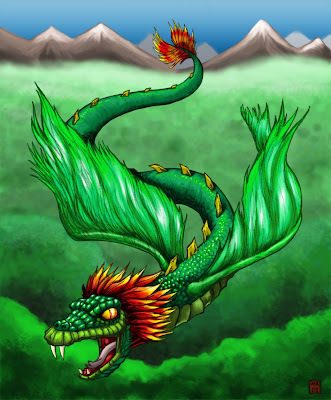 Quetzalcoatl was worshiped in one form or another by many different Mesoamerican cultures. He is usually associated with teaching and wisdom, water, and the morning star. Quetzalcoatl has a (perhaps biased) depiction in the Codex Telleriano-Remensis as a monstrous serpent, devouring a man, but is often shown in human form as well from various pre-Columbian sources. Depictions of the God as feathered serpent (or amphithere) go back to the Olmec culture (1150 - 500 B.C.) and before.